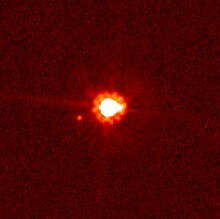 ^ 2.0 2.1 2.2 2.3 Brown, M. E.; Schaller, E. L. The Mass of Dwarf Planet Eris. Science. 2007, 316 (5831): 1585. Bibcode:2007Sci...316.1585B. PMID 17569855. doi:10.1126/science.1139415. ^ 4.0 4.1 4.2 4.3 Johnston, W. R. (136199) Eris and Dysnomia. Johnston's Archive. 30 December 2008 [2012-04-12]. ^ 5.0 5.1 Brown, M. E. Dysnomia, the moon of Eris. Caltech. 14 June 2007 [2011-07-03]. ^ 6.0 6.1 6.2 Green, D. W. E. S/2005 (2003 UB313) 1. IAU Circular. 4 October 2005, 8610 [2012-01-12]. ^ Green, D. W. E. (134340) Pluto, (136199) Eris, and (136199) Eris I (Dysnomia). IAU Circular. 13 September 2006, 8747 [2012-01-12]. ^ Zabarenko, D. Planet Xena has moon called Gabrielle. Australian Broadcasting Corporation. 3 October 2005 [2008-03-09]. ^ Ingham, R. 'Tenth planet' Xena bigger than Pluto. Australian Broadcasting Corporation. 2 February 2006 [2008-03-09]. ^ Tytell, D. All Hail Eris and Dysnomia. Sky & Telescope. 14 September 2006 [2006-12-30]. ^ Julia Sweeney and Michael E. Brown. Hammer Conversations: KCET podcast. 42 min 12 sec. 2007 [2008-06-28]. （原始内容存档于2008-06-26）.